NEXT | What does "Warcraft 3 in World of Warcraft" look like to you? For many classes and specializations, the Battle for Azeroth version plays similarly to the current Legion version, minus the Artifact traits, tier sets, and Legendaries. If you like the playstyle of the Legion iteration of your class, you’ll probably like the Battle rendition. But Survival Hunters are one of the big exceptions to this. Though the spec hasn’t gotten the same sort of extensive rework it did in Legion, it’s seen some significant changes. So what is the new Survival Hunter like, and is it a fun class to play? My own Hunter has been Beast Mastery for most of Legion, but I’ve been interested in the Survival changes since I first saw them on alpha, and I’ve been playing Survival on both alpha and beta. If the numbers work out, I plan on Survival being my Hunter’s primary spec in Battle. So let’s take a look at the state of Survival, but with the standard beta caveat: anything you see here is subject to change. Blizzard hasn’t done final numbers tuning on the beta, and until then questions about performance or how Survival compares to other melee specs are, at best, guesses. Sims, and theorycrafting about rotations, and talents analysis also depend on tuning, which just hasn’t happened yet. Survival is still a melee spec, but it can use many rotational abilities from range. Serpent Sting is back, and Dragonsfire Grenade is now Wildfire Bomb. 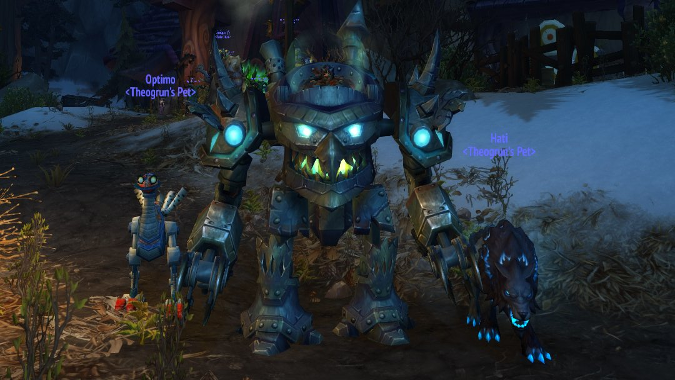 You have your own version of Kill Command (more on that later), and as long as your pet is in melee, Kill Command can be used from range. The only spells you can’t cast from range are your main nuke, Raptor Strike, and your AOE spell, Carve. Most of the time anyway. The new Aspect of the Eagle lets you cast Raptor Strike from range for 15 seconds on a 90-second cooldown (and the cooldown can be reduced by 20% with the Born to be Wild talent). To use a current example of where Eagle might be handy, if you got targeted by Toxic Wound during the Serpentix fight in Eye of Azshara, you could Disengage, which is now baseline, to get away from the boss and hit Aspect of the Eagle. You would continue your rotation, minus your auto attack damage for a few seconds. Once the debuff drops off, you Harpoon back and get your Terms of Engagement buff (if talented), or you can use a new talent that stole the Flanking Strike name. There are a couple of bosses in Battle’s dungeon’s which have a similar mechanic to this. If you play Survival on live, you no doubt noticed the omission of Mongoose Bite over on the beta. It’s now a talent, and at present, is either undertuned or bugged. It takes getting 4 stack of Mongoose Bite to equal one Raptor Strike. Hatchet Toss got tossed. Explosive Trap and Lacerate are no more. One thing you’ll lose at range: auto attack damage at range, which is significant. Auto Attack is is a bigger part of melee DPS in Battle than in Legion and should account for about 10-20% of your damage. Still, Survival has some DPS options when pushed out of melee range. Survival has fantastic pet synergy. It’s not quite Beast Mastery levels, but your pet will be responsible for 20-30% of your overall damage, pending tuning. As mentioned, Survival gets its own version of Kill Command which is a Focus builder for Survival rather than a spender as it is for Beast Mastery. Survival gets its own version of Bestial Wrath called Coordinated Assault (you and your pet even get all big and red). Coordinated Assault can be extended by the Birds of Prey talent and I’m sure there will be screenshots and log parses as each Hunter tries to keep Coordinated Assault up the longest. Coordinated Assault (and Bestial Wrath for Beast Mastery) are on the Global Cooldown in Battle like most other major DPS cooldowns. Survival’s new Mastery: Spirit Bond increases your damage similar to Marksman’s and includes a bit of healing which scales with your Mastery. This will be like having the Roots of Shaladrassil on all the time, but you don’t have to stand still to take advantage of it. Survival Hunters look to be a hardy melee DPS in Battle. Shrapnel Bomb causes Raptor Strike and Carve/Butchery to apply a Bleed and provides synergy with with the Bloodseeker talent. Pheromone Bomb causes you Kill Command to reset its cooldown and works in concert with the Alpha Predator and Tip of the Spear talents. Volatile Bomb causes your Wildfire Bomb to do double damage against targets with your Serpent Sting on them and provides synergy with the Viper’s Venom and Hydra’s Bite talents. Hitting a DoTted up group with a Volatile Bomb is one of the most fun and satisfying moments I’ve had in game in a long time. There’s nothing all that complicated about Survival at the moment. The Mongoose damage windows are gone. If you love the current “spinning plates” aspects of Survival, there’s a good chance the new Survival won’t appeal to you. If you don’t take Wildfire Infusion, Survival is pretty much just keeping everything on cooldown and making sure you don’t cap your focus if you get a couple of lucky Kill Command resets. Screenshot courtesy of Zenndra from the Trueshot Lodge Discord server. Used with permission. Where will Survival fit in the new class meta? The developers want to enhance class diversity in Battle for Azoerth, making each encounter to feel different based upon your group composition. This could also impact the overall difficulty of a given encounter based upon your group, though it will have a greater impact on Mythic+ where your group size is smaller. The player base is full of smart, strategic thinkers. Like other Blizzard games. a meta will form as they will solve for the best group composition for any encounter or instance. But will groups want Survival Hunters? The spec faces stiff competition in the meta. Groups will want a balance of range and melee DPS, and other melee provide important, unique buffs. 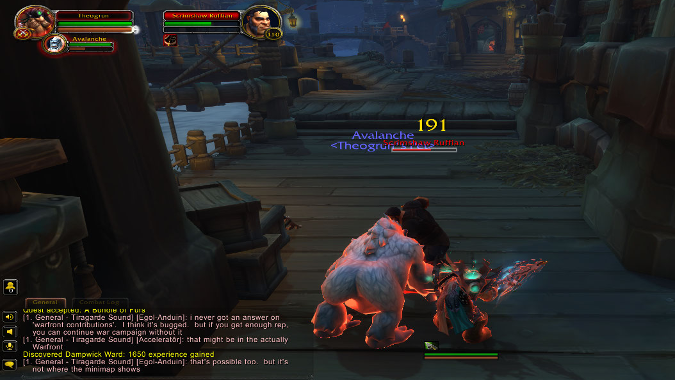 Warriors have a Strength and Agility buff for groupmates. Demon Hunters have Chaos Brand to buff magic damage and Monks bring Mystic Touch to buff physical damage. While there are consumables that mimic the Strength and Agility buff, there are none to replicate Chaos Brand or Mystic Touch. Survival, like all Hunters, has Bloodlust/Heroism, but that’s also available from Mages and Shamans as well as a consumable. 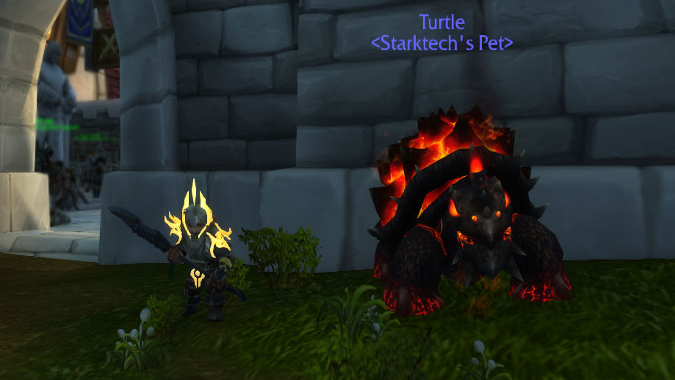 Where Hunters may shine is with their ability to remove Enrage and Magic effects through their pets. No fewer than six different families have dispel, two from each specialization. Tenacity has Crane and Stag, Ferocity has Bat and Nether Ray, and Cunning has Moth and Sporebat. While Shamans also have Purge, the only other class that can remove enrage is Druid. This gives Hunters some some decent group utility. War Mode provides a nice experience bonus for leveling and opens up your PVP talents. The Goblins have been hard at work on Explosive Trap and it is a now a PVP talent called Hi-Explosive Trap. Roar of Sacrifice is also now a PVP talent. You could go with a crowd control heavy build with talents like Hi-Explosive Trap, Tracker’s Net, and Diamond Ice. You could go more tanky with Roar of Sacrifice, Dragonscale Armor, and Survival Tactics or Mending Bandage. Freezing Trap and Steel Trap can be down at the same time letting you CC two different targets. I’m not a PVPer by any stretch but there are lots of possibilities. Pop a Hi-Explosive Trap for the knockback, then Disengage, reset the fight, or use your CC. When I looked at Survival with all the bombs, and gadgets like Harpoon and the little crossbow you pull out for Serpent Sting, I thought of my dreams of having the Tinker Hero class from Warcraft 3 in game. Before the Demon Hunter class was introduced, Rogues would get the Cursed Vision of Sargeras, and the Warglavies of Azzinoth and pretend to be a Demon Hunter. I thought about race changing to Gnome, grabbing a Mechanical pet and pretending my Survival Hunter was a Tinker. Sadly, my Tinker dreams, at least for PVE, took a major hit with the pet changes. Pets can no longer change their spec, and the Mechanical family is Cunning. The go to PVE pets will be Bats if you need Bloodlust/Heroism, or Cranes if you don’t. Cunning is best suited for PVP content. But Ted, is Survival fun to play? Survival has been a blast to play on beta. You’re a melee DPS pet class with great mobility and if you’ll pardon the pun, survivability. Harpoon is fantastic gap closer. Wildfire Bomb provides a satisfying moment and Wildfire Infusion provides a good degree of interaction, though its yet to be seen if Wildfire Infusion will be competitive after the tuning pass. As far as utility, you can bring Bloodlust/Heroism and an offensive dispel. I can easily see myself spending many hours with my Survival Hunter in Battle. The changes are on the PTR now, so give Survival a try and let me know what you think.